New for 2012. Samsung’s top of the line, third generation of 3D LED backlit TVs from Samsung. SmartReview previewed this model at CES 2012 (see our commentary). Samsung’s UN55ES8000 55-inch LED backlit HDTV (with Micro Dimming Ultimate) is 3D ready and comes with 4 pairs of 3D glasses. The new for 2012 Micro Dimming Ultimate LED backlight technology is an improvement to last year’s Micro dimming. It uses special edge mounted LEDs to enable the controlled lighting of variable size areas. This provides for better picture and contrast whether watching 2D or 3D. 3D movies such as Avatar and other movies have created demand for 3D programming for HDTVs for the home. With this HDTV you can use the included 3D glasses with 3D Blu-ray players, and watch 3D specific programming as they come available on cable and satellite. Ultra Clear Panel eliminates reflections, boosts contrast ratio. Included on this TV is 960 CMR (clear motion rate) anti-blur technology. 240Hz provides blur free, clear motion. Upgraded 30,000,000:1 Mega Dynamic Contrast (highest we have reviewed). This full HD 1080p HDTV has several new ways to interface with the TV, including Gesture control (using your hands), and voice control. Its built in camera has face recognition to bring up your profile, or use Skype. DLNA CERTIFIED® connectivity lets you remotely access music, video, and photos. The 1080p display has over two million pixel resolution, along with an SRS TruSurround HD sound system. Smart TV: The Samsung ES8000 series is internet ready with Samsung Apps (hundreds available) and Web Browser (broadband service required) which will give you access to Netflix (with subscription), Youtube, Facebook, Blockbuster, Hulu Plus, Twitter, Sports and more. Just plug in an ethernet cable, or use the included Built-in wireless Wifi. The UN55ES8000 can display lifelike 3D images when viewed with Samsung’s 3D shutter glasses (included 4 pair). The ES8000 series can Convert 2D movies, sports and shows to 3D. Ultra Slim Design, only 1.2 inch thick (without stand) and an ultraslim bezel. Energy Star compliant. ATSC with QAM digital TV tuners built in. 1 Component video input, and 3 HDMI (ver 1.4) inputs for full 2D/3D connectivity for DVD players, Blu-ray, PS3, Camcorders, PCs and a range of other digital devices. Also features two 10 watt stereo speakers. 3 USB 2.0 ports for digital photo/video/MP3 playback, Ethernet port. Remote control with QWERTY keyboard (use the keyboard to type text with wifi features). The remote has a touchpad, keyboard, and a microphone (for voice commands). 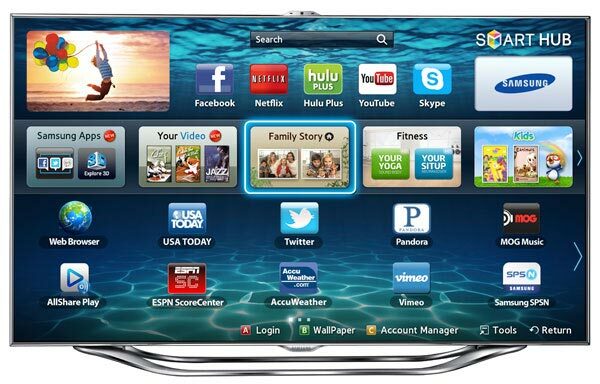 Smart-Review Commentary: For 2012, The UN8000 “ES” Series is Samsung’s third generation LED 3D TV and comes fully loaded. SmartReview saw this TV at the Consumer Electronics Show. We felt this TV had the best picture we had seen at the show for a 1080p LED TV. Beautiful colors and contrast. (See our picture above). The biggest improvement is its powerful dual core processor (first in a TV), which will speed up the Smart TV features, allow multitasking, and allow new features. Many of the older Smart TVs are just too sluggish, so the dual core processor should remedy that. The new Micro Dimming Ultimate adds special algorithms and scanning technology to give you a better more uniform picture with higher contrast. 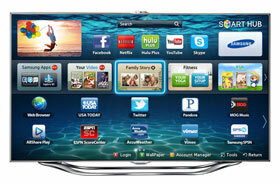 Samsung has added many new ways to communicate with your TV. Voice control (you control your TV by speaking commands), Gesture Control (move your hands to change things on the screen), and a touchpad on the remote which allows you to change channels, change apps, or use the web browser. For 3D Samsung has provided 4 pairs of 3D glasses (up from 2 last year), has a higher contrast of (30,000,000:1), an upgrade to 960 CMR anti blur technology with 240Hz, and lower power consumption (82 watts). The ES8000 won the Innovation Award at CES 2012. This is a nice upgrade from last year’s D8000 model. 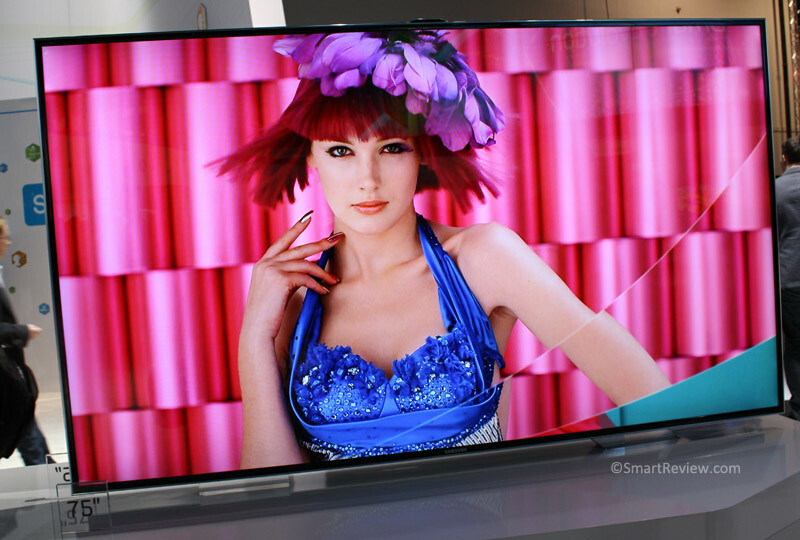 We believe that this will be one of the top LED TVs for 2012 and is a SmartReview Top Pick.